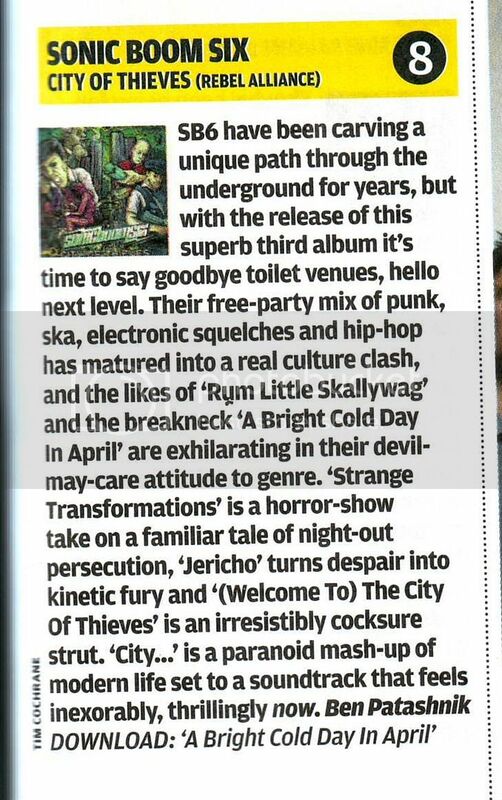 Manchester’s Sonic Boom Six return with their third album City of Thieves, the fifth record to be released on their own Rebel Alliance Recordings. 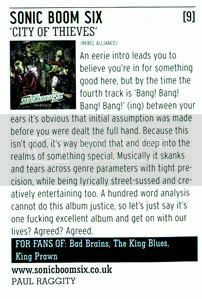 Whilst SB6’s eclectic punk soundclash staunchly remains far too down-to-earth to ever being described as ‘prog’, the album follows the concept of a collection of songs that explore and examine life in a large UK city. From crass consumerism to traffic congestion, lawless youth culture to homelessness, binge drinking to street violence, Laila and the guys cast their pragmatic critique on the state of the nation, embellished by their characteristic positivity and humour. City of Thieves is built on the bedrock of the band’s unique ska-core/hip-hop/jungle hybrid but (in keeping with their original ethos of expanding the boundaries of what a punk band can be) adds dubstep, electro, dub and even glam rock to the mix, all the while retaining the snarling live edge honed by recent tours of the UK, Europe and the US with acts such as Reel Big Fish, Less Than Jake, Bad Brains and Big D and the Kid’s Table. The first class collaborators involved in the record include production duties by Peter Miles (The King Blues, The Steal), artwork courtesy of Dan Mumford (Gallows, ADTR) and guest appearances from Al Rumjen (King Prawn, ADF), Robin Leitch (Random Hand), and more! 4. Bang Bang Bang Bang!